Protect important materials small to large with a durable gloss laminate. 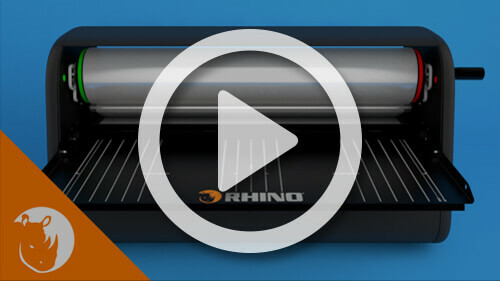 The Rhino uses cold lamination technology to save energy and produce high-quality results without causing curling, blisters, waves, or other damage to the finished product. It’s ideal for banners, photos, poster boards, and retail displays. Simple: instantly laminate documents without electricity. Convenient: operate right away without warm-up or cool-down needed. Easy to use: anyone can operate by manually turning the handle. Versatile: expand rollers to use with different size supply up to 3/16” thick and 25” wide. High-quality: evenly laminate multiple items at once using the tray alignment marks. Efficient: requires little maintenance or cleaning and includes built-in replaceable sliding cutter. Lifetime support: receive free customer support.